-if it sounds bad…what’s the point? isn’t the whole idea of music to be pleasing to the ear? -musicians are just trying to be all hipster and “different” for no actual reason.. 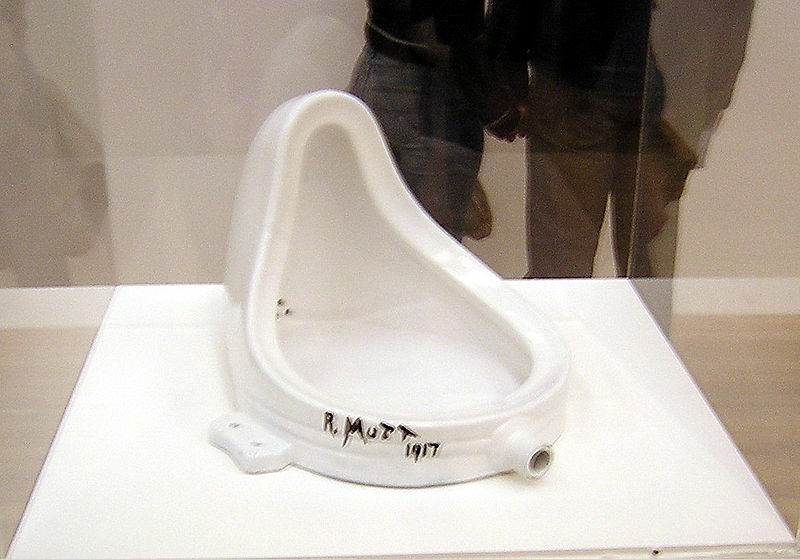 Truly I felt the same way many people feel in a Modern Art Museum when standing in front of the “hilarious” R.Mutt toilet.. But I was really, Reeeeaaalllly wrong. For a number of reasons. I don’t know if the people complaining about modern art are wrong, but I know I was,and so are most people who want all music to sound good. That’s not to say that there is a lot of crap that’s produced and sold as being experimental or something, but that should go without saying. Traditional tonal music is essentially a very simple formula with a lot of room for fun. You choose a key, you start on the tonic, or the first note (Do), you build tension (by going to the 5th note, or the dominant) and then you return to the tonic. Then rinse, lather and repeat. And voila! You can add chords, related keys, different rhythms and blah blah blah etc., but at it’s essence, that is it. One, Five, One. So for a long time there was seemingly enough space to navigate within and experiment plenty. But of course, rules are made to be broken. First Mahler and Schubert and what have you started playing around with progressive tonality in the 19th century, which is when a piece ends in a different key and tonic than it began. Stravinsky and Bartok (among others) started really experimenting with poly-tonality, that is 2 keys being played simultaneously in the early 20th century. Coincidentally (or not), these experimentations began at the same time as the Romantic period of music. You see back in the day of Baroque and Classical music, in general music was “absolute” meaning, just music, representing emotion possibly, or nothing in particular. Program music (music that tells a story) had existed a long time sure, but it really was in vogue in the Romantic period. People began telling stories with their music, and so needed a much wider variety of options in order to do that. Another feature of this period is that composers were all about searching for true emotion and the depth of humanity, and so it would seem, felt that there were too many restrictions placed on music to really be ablt to tackle the truth. And in art, like life, the truth is often ugly and definitely not pleasing. So around the same time we got atonal music. It doesn’t really have a tonal centre, or a key, and the aim is to avoid traditional harmony. Thanks to our buddies Schoenberg and his contemporaries we were introduced to serialism as well, atonal music with a strict set of rules. Atonality was used by a lot of famous composers, including Debussy and the aforementioned Bartok and Stravinksy. Wozzeck is about a man who is undergoing experimentation to get extra money, and his relationship with his girlfriend and their illegitimate child. It explores mental illness, jealousy, murder and lots of other things that would be difficult to set music to. Have a listen, and just imagine the different effect the music would have on the text were it written by Andrew Lloyd Webber or something. It is haunting and unresolved in a way that seems very operatic and still true to life. Another cool one that I love is from Schoenberg himself, the song cycle, “Pierrot Lunaire”. The thing about atonal music is that everything is actually used for a reason. Unlike popular opinion, it is not just ugly for the sake of being different (well except for the stuff that is). It is ugly in a very specific way, to move the listener to understand the darker side of human emotion that can’t be expressed by something sweet sounding, or even something that resolves. It’s meant to disturb. And it absolutely can’t be accomplished easily. Certainly, you probably won’t listen to atonal music in the bathtub or at the gym, but it has it’s place in the music world. Imagine scary movies without it, psychological thrillers and the like. Expressionist opera and song cycles, protest performance art. Not to mention being the basis for other new and exciting experimentation.